JUST as rock star and humanitarian Bob Geldof, of Live Aid fame, was moved by the hunger of children in Ethiopia, so was Lynda Mussell. Lynda, a newcomer to the Catholic community in Brisbane and new to Australia, is still moved in the face of poverty and injustice, and she’s determined to do something about it. 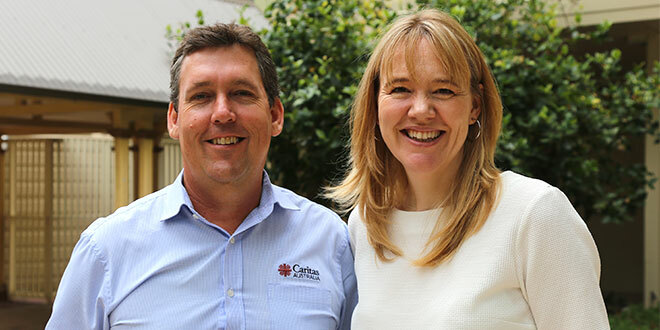 She’s the recently appointed diocesan director of Caritas Australia in Brisbane, a challenge she’s travelled from the other side of the world to take on. When Geldof and a host of international rock stars rallied the world to help the starving children of Ethiopia through the charity super concert Live Aid, Mek’ele was a place with seven “hunger camps” during the nation’s 1983-85 famine. And Mek’ele was where Lynda joined the Daughters of Charity in 2009 as a volunteer reaching out to Ethiopia’s poor children. She went there to teach English as a Second Language at a summer school. The children needed that from Year 8 onwards because all subjects were taught in English. Lynda said there were many times she was struck by the poverty around her. “I was teaching in a class where there were all ages, from nine to about seventeen, and I remember thinking some of the children were much, much younger and it was just down to simple lack of nutrition,” she said. “Some of the children were so tiny. “And I remember going to visit some of their houses as well, and seeing just how tough they had it. “Many were coming into the summer school – they had a lunch provided – but they were so determined to try and get a really good education. “They were just as ambitious as any children I’d ever met as a teacher but they’d do extra work at home and there was no electricity, there was no sanitation in the houses that I saw. Lynda was struck by their resilience and strength in such dire circumstances, and by the difference that the Church’s aid can make. “That year that I was there (the sisters’) first student had just graduated from university, so they were able to make a difference,” she said. Now, she’s come to Brisbane to make a difference and to lead others in doing the same. She’s hoping to build on the good work of former director Joe Foley after working alongside him for a while last year. Lynda had been working for CAFOD (Catholic Agency For Overseas Development), which is one half of Caritas England and Wales, and was due for long-service leave. She has dual nationality in Australia, through her mother who was born in Ayr, North Queensland, and she had always enjoyed the country when visiting relatives here so she decided to use the connection. “I wrote to Caritas Australia and told them I had time off – ten weeks – would they be able to make use of me over Lent?” she said. “I said ‘You don’t have to pay for anything; I’ll pay for my flights’. As a volunteer, Lynda travelled around promoting Caritas Australia’s annual Lenten appeal Project Compassion, visiting places like Toowoomba and Rockhampton, and parishes and schools around Brisbane. She loved it and was particularly impressed by the strong support Caritas received from schools, parishes and Church agencies for the Project Compassion launch. Lynda returned to Portsmouth diocese, where she had worked for CAFOD, to make preparations to return to Brisbane to work for Caritas. Once back with the Caritas team in Brisbane, she took up a six-month contract working on community volunteering. She’s worked with five parishes piloting a new role – parish representative for Caritas – and has been delighted with the response. When Mr Foley resigned, Lynda applied for the director’s position and was recently appointed. From her years heading CAFOD in Portsmouth, Lynda loves development work and building strong connections with supporters in the parishes. “What hooked me (into working for Caritas)? I think it’s because it has a direct correlation between your faith, your essence of being and what you believe in in life, and actually it does answer the call of the Gospel – the call to love our neighbour as ourselves,” she said. “Personally, I can’t just carry on, knowing that other people don’t have access to some of these basic things in life that we have …,” Lynda said. Lynda’s always been motivated to help others. “I remember the whole Make Poverty History in 2005 – that was a huge wake-up call for lots of people and just how they brought everything into stark focus – but I think inequality and poverty is around us in many forms,” she said. “There certainly is the UK, and I imagine there will be here, too, in Australia, and I think unfairness, injustice that’s something that you become aware of. And that feeds into her faith and her relationship with God. “To draw closer to God, for me, to become closer to God, is to become closer to your fellow human beings, really,” she said. “And I think that’s local as well as global. At the moment I’m joining two local charities as well, to volunteer my time. Whatever she asks a volunteer or supporter to do, Lynda will do herself – with one exception. “I don’t think I would ever ask somebody to volunteer to do something I wasn’t prepared to do myself … although I’m not a good runner …,” she said. “We (CAFOD) used to do the Great South Run (in Portsmouth) and I’d just think, ‘I know I’d be sick as a dog’. “But everything else … If I said to somebody, ‘I’d really like you to speak at Mass … or I’d really like you to go and meet your MP … or I’d like you to go into a school and do this …’ I used to think, ‘Not unless you do it yourself’. And she’ll be practising what she preaches. “When things settle down for me a bit I would like to be a parish representative here in my parish,” the new director said.